An additional glass sheath enfolds this office building to ward off the smell and noise of the surrounding airport. 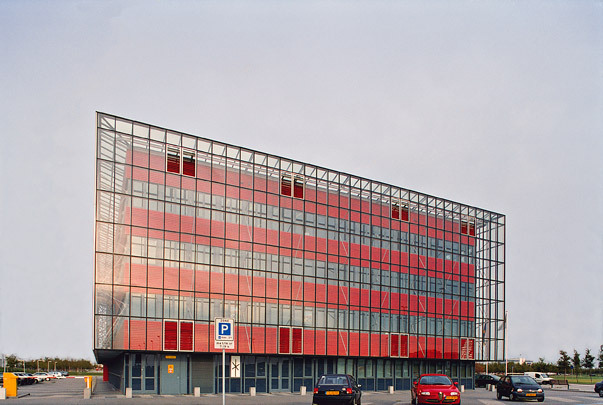 The offices themselves occupy a winding volume of standard office floors, whose facades combine ribbon windows with bright red perforated and profiled steel sheet. Large linked winter gardens occupy the space between offices. Besides keeping out unwanted smells and sounds this zone acts as a congenial ‘outdoors’ for the offices and a buffer space for climate control purposes.